In this episode of Inbound Sales Journey, Ryan and Gray discuss how to use workshops to grow your agency. Workshops came into popularity in the inbound world with the Marcus Sheridan and George Thomas over at the Sales Lion. Their plan to hold workshops to explain and get everyone in person and on getting buy-in on implementing inbound at a company has sparked a lot of ideas. Once concept we wanted to explore was one one of our DoInbound customers here does. She combines an in-person workshop with the GamePlan. This way you're in person and get all the info you need, do a deep dive, build rapport and sets the tone in person from the start. It combines the benefits of both and gets your project off to a fast start. Here are the four steps to implementing workshops at your agency. Have a set process for onboarding the client and know that you can deliver value with your workshop. What does a workshop look like in your agency? If you don't have anything set, take the time to do it. Don't sell something you don't have a process or strategy for. Have something organized and templated so that the value is there before selling it. You want to have a clear idea of what the outcomes are for the client after holding it. If you have specific niches you're targeting, make sure you take the time to set something set up that is customized for that niche. You can then replicate this process over and over again. Take the time to build a streamlined process for your workshops. Create resources and material and content for how to get it to them. Have case studies, landing pages, content offers, and videos all driving towards and explaining the value of a workshop. This is a chance to show why they need to be exploring a workshop option, even if they aren't buying a retainer. It's the first step to demonstrating the value of inbound in an engaging way. Have a sales deck for how to do it and what they need. This is something that you would give to them exactly detailing what they'd get by signing up. You want some clear sales materials so that not only do they know what they're purchasing, but they uphold their end of the workshop. You need to make sure this is a good use of their time and yours. You want to make sure the right people are there, the resources you need to do your work is there, and that it's al there as well so you can move ahead on the project. Figure out how you want to price it. Will you include travel or is that bundled in the price as well? How much is your time worth? You may be spending 8-12 hours in person with their team, and you want to make sure you're paid accordingly on top of all the traveling. You need to learn to sell these as well. If you're just starting out, we recommend selling to current clients. Or if nothing else, run it for your agency and reap the benefits. Workshops with a GamePlan process can help you sell more, get a great start, deliver tons of value and sets your agency apart in the sales process. 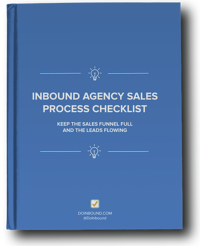 Workshops are a great addition to your sales process, and one more inbound agencies should put in place.